Next in the series on Big Bull Jerky is this Sweet Onion variety. See my previous reviews of their Original and Habanero. Big Bull Jerky is a brand of Joes Beef Jerky Enterprises, based out of St. Paul Park, MN, and run by a guy named Joe Hinz. The brand has been around for several years, at least as far back as 2003 according to one reference I found. Joe makes jerky in his own USDA approved facility. This Sweet Onion is just one of 15 varieties of beef jerky they offer, and they also have another 4 varieties of grass-fed beef jerky. 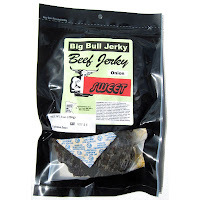 This is the last of the Big Bull Jerky I have left to review. Beef, water, AuJus Mix [Seasoning (hydrolyzed corn gluten, wheat protein and soy protein, partially hydrogenated soybean and cottonseed oil), hydrolyzed corn protein, salt, shortening (partially hydrogenated soybean oil & cottonseed oil, TBHQ and citric acid), habanero peppers, onion powder, yeast powder, sugar, caramel color, disodium guanylate, disodium inosinate, natural flavorings], contains less than 2% of garlic, spices, salt, paprika (color), dehydrated onion, red pepper, chili pepper, dehydrated onion, dehydrated red & green bell peppers, citric acid, spice extractives, natural flavor, sodium nitrite, red #40 lake. The first thing I taste from the surface of these pieces is a light saltiness, and a light meaty aroma. Overall, a very simple flavor, and a low surface flavor intensity. The chewing flavor starts with a light natural meat flavor, a light sweetness, and I do taste a moderate onion flavor. Well, for being billed as a "Sweet Onion" variety, I think this does live up to that billing. I do taste a moderately intense onion flavor, more so in some pieces than others. It's the more moist pieces that have the extra flavor, whereas the drier pieces have little. The sweetness is easily noticed, but not necessarily a strong or moderate intensity, it's just light. When I reviewed Big Bull Jerky's Original and Habanero varieties, I reported a "saucy" flavor, perhaps from the AuJus ingredient. I find that same flavor in here as well, but less so. I think it's still there in the same level, but that sweet onion flavors compete against it, pushing it towards the back. There's also a light, or very light, natural meat flavor. It's just barely strong enough to contribute to the overall flavor, but not quite strong enough that you can enjoy it. It tends to have a cooked meat flavor. The level of saltiness seems light. Overall, it's the onion flavor that provides the bulk of this jerky's flavor, the sweetness is easily noticed, but still light, and is still a dominant flavor only because there's little other flavor in this jerky. You'll notice a light natural meat flavor. It's a light tasting jerky in general. These are slices of whole meat, sliced medium to thick thickess, and in small to medium sized pieces. I'd classify this as a dry jerky, but there's several pieces that could qualify as "semi-moist". The dry pieces vary from somewhat brittle, to just plain brittle. The semi-moist pieces have a lot of flexibility. Overall, tearing pieces apart with my fingers seems easy, while chewing varies from easy to quite labored. The chewing texture starts off feeling stiff and woody, but is breaks apart very easily with just a light amount of biting. It chews down to a soft mass quickly, but only feels crumbly, never steak-like. The softer, more moist pieces was not as crumbly, and had a more steak-like texture, but was still a little bit crumbly. 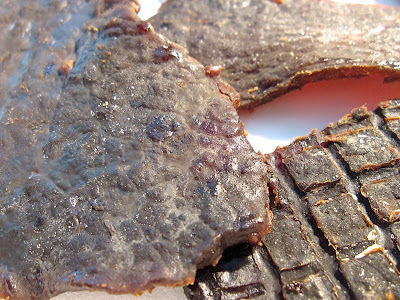 I don't see any chunks of fat on this jerky, but I do see gristle on just about every piece. However, the gristle didn't seem to show up in the chewing, that is I didn't really feel it. Breaking pieces apart with my fingers reveals quite a bit of stringy sinews, but they too didn't show up much in the chewing. In terms of clean eating, I'm not seeing any residue on my fingers, and no fragments falling on my lap or desk. Big Bull Jerky sells this Sweet Onion variety at a price of $8.92 for an 8oz package. I bought 3 packages, each a different variety. Add to that shipping of $6.00, and that's a total of $32.76. That works out to $1.37 per ounce. 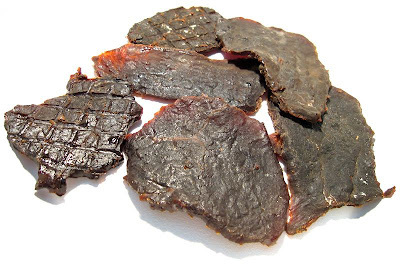 For general jerky snacking purposes, at the $1.37 price per ounce, it's a fair value. I'm getting some snackability, perhaps slightly below average. It has a decent flavor with the sweet onion, but the meat consistency and chewing texture is subpar. However, the price of $1.37 per ounce is lower than store-bought mass-market jerky, yet overall you're getting an equivalent jerky. As a Sweet Onion variety, also at the $1.37 price per ounce, it's a good value. I'm getting a fair amount of sweet, and a better amount of onion flavor. If that sweet onion flavor is what you particularly crave, I think you'll get a good deal of bang for your buck, considering the price is lower than average. This Sweet Onion variety from Big Bull Jerky gave me just enough snackability to get it up to an average rating. That's thanks in part for actually providing a decent amount of sweet onion flavor, more so with the onion, and less so with the sweet. There's also a light bit of natural meat flavor, and a light bit of that "saucy" flavor that I reported on Big Bull Jerky's other varieties. The chewing texture of this stuff is not all up to snuff, being largely crumbly, and not really providing the satisfying chew that beef is supposed to provide. Some pieces in this bag were semi-moist and those pieces gave off a stronger flavor. Overall however, this jerky is still rather light on taste. I want a jerky to pound out its advertised flavor and make me open my eyes wide and say, "Wow!". So I'd like to see a thicker sweet, and a sharper onion flavor. I'd also like to get a stronger natural meat flavor, and a better chewing texture. I think a good beer for this is a brown ale.